First, make the sichuan seasoning. Dry-roast the sichuan pepper and 3 teaspoons of sea salt in a heavy-based pan. When the peppercorns start to pop and become aromatic, remove from the heat and allow to cool. Once cool, grind to a powder in a pestle and mortar or spice grinder. Next, make the chilli dressing. Place the chilli flakes in a heatproof bowl. Heat the oil in a small heavy-based frying pan until it shimmers slightly, then carefully pour the oil over the chilli to release the heat and flavour. Stir, then let stand, uncovered, for 30 minutes. Strain the oil through a fine sieve over a bowl (discard the chilli), and mix with remaining dressing ingredients. For the wontons, peel, dice and place the prawn meat in a bowl. Trim and finely slice the spring onion, peel and finely slice the ginger, then add to the bowl with all the remaining ingredients, except the wonton wrappers, and mix until combined. Cover and refrigerate for 30 minutes. For each wonton, place a rounded teaspoon of prawn filling in the centre of a wrapper. Dip your finger in some water and moisten the bottom edge of the wrapper, then fold it in half, towards you, to enclose the filling. Smoothing out any air, press to seal. Hold the wonton lengthways with the folded edge down. Fold in half lengthways, then lightly moisten one corner of the folded edge. Bring the two ends together with a twisting action and press lightly to seal, making a ring shape. Bring a large pan of water to the boil. Carefully drop the wontons, in batches, into the water and cook for 2 minutes, or till just cooked through. 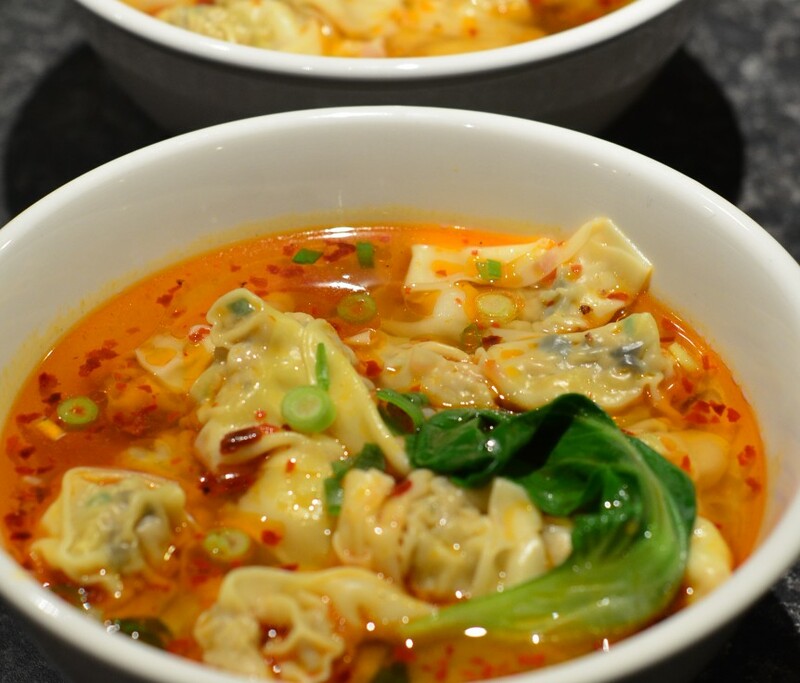 To test if the wontons are ready, remove one using a slotted spoon and cut through it with a sharp knife. The prawns should be just cooked through. Remove the other wontons and drain in a colander. To serve, arrange the wontons on a serving platter. Stir the chilli dressing and then spoon it over the wontons. Serve immediately, sprinkled with sichuan seasoning.